Working today, but I don't mind. Sometimes the smell of the wood shavings and the gentle sigh of the teeth of the saw in the cut make up for the time taken from leisure. This guy's likely currently demonstrating the adage: "I'll sleep when I'm dead." His hard work is remembered, though. 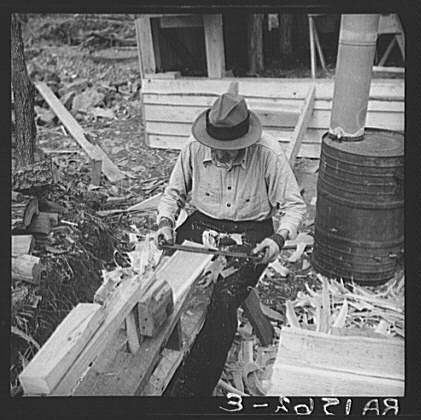 How many people reading this know how to use that drawknife he's got, or has ever seen that "dumbhead" shaving horse he's sitting on? Those shingles he's making by hand come in a big cardboard box now, neat as pins, fashioned entirely by machines, and ready for your house. It's unlikely the modern fellow applying them to your house is wearing a fedora. Money ain't dignity. Back in the late 60s, there was a back-to-earth movement of earnest young people turned off by (what they saw as) the impersonal, mechanistic nature of the world they inherited. They sought the ways and wisdom of what seemed a more holistic and natural way of life. 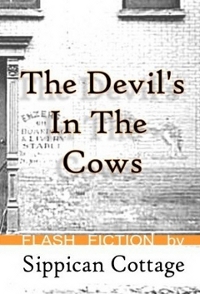 They went into the backwoods with notepads and tape recorders, interviewing simple people who lived off the land. They wanted to reconnect with old folkways before they disappeared. They wanted to learn the skills to fend for themselves and publish what they found. Foxfire magazine (and the book by the same name) shared with an urban and suburban generation how to make soap, how to slaughter and boil a hog, how to split oak for caning, how to build a fireplace, how to use a shaving horse, adze, and draw knife. I'll have to go dig that book out.